Buy your ticket now & save! We're excited to welcome The Contingents to The Caribou Room Friday, November 11, 2016. You won't want to miss this amazing new collaboration featuring members of Leftover Salmon & Yonder Mountain String Band! Jacob Jolliff has been playing the mandolin since he was seven years old. Growing up in a musical family, he got his start taking lessons from his dad, Bill, a well-known Oregon banjo player. By the time Jacob turned 11, the two were gigging heavily together, and their band was a mainstay at bluegrass festivals around the Northwest. At age sixteen, after hundreds of gigs and four full-length recorded projects, Jake decided to take a break from working with his dad to explore performing in a variety of other contexts. Greg Garrison has strong connections to the musical worlds of bluegrass, folk, jazz, and rock, and has been able to work with a wide range of musicians including Bill Frisell, John Scofield, Joe Lovano, Jerry Douglas, Sam Bush, Ron Miles, Del McCoury, Jayme Stone, Art Lande, Fred Hess, Rudy Royston, Edgar Meyer, Bryan Sutton, and Vassar Clements. Alwyn Robinson has been performing music since the tender age of three under the watchful eye of both his father and his two older brothers. The Texan spent his college years at Texas Tech University and CU Boulder studying classical percussion as well as marching percussion and has been playing in local bands since he was 14-years-old. The Sweet Lillies' high-energy, melodic tunes have quickly captured the hearts and music souls of fans in Colorado and beyond. The band, formed in November of 2013, credits its appeal to the original and compelling songwriting of all four of its members. The magnetic combination of Julie Gussaroff on the upright bass, Becca Bisque on the viola, Danjo Lynn on the banjo and Melly Frances on percussion and guitar–together with powerful three-part female harmony–give this band a rare and alluring sound. As testament to their appeal, The Sweet Lillies have already shared the stage with the likes of Peter Rowan, Vince Herman, Kyle Hollingsworth, Andy Hall, Rob Eaton, Bill McKay, Jake Wolf, Dave Abear, Yarn, and Drunken Hearts. 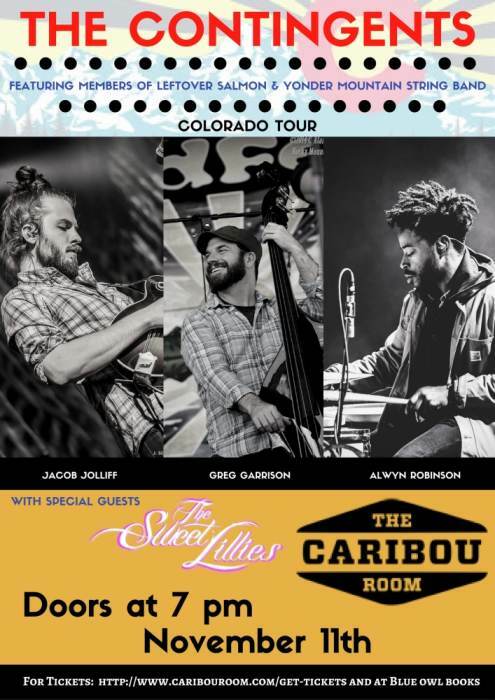 Based out of Colorado’s Front Range, The Sweet Lillies are continually expanding their audience and reach, building fan and critic support through an unwavering commitment to creativity, a contagious love of music, and a get-up-and-dance attitude that spreads lots of love and smiles.